Alex Jones broadcasts from the 2016 Republican National Convention. Alex Jones isn’t a conspiracy theorist who thinks “globalist” elites staged the Boston Marathon bombing, and Hillary Clinton and Barack Obama reek of sulfur because they are demons — he just plays one one the radio. Over the next two weeks, a Texas jury will decide whether Jones’s “performance” reflects who he is in private life, and whether that has any bearing on his fitness as a parent. His ex-wife, Kelly Jones, says there is only one Alex Jones, and his on-air persona is part of the reason that she should have custody of their children. 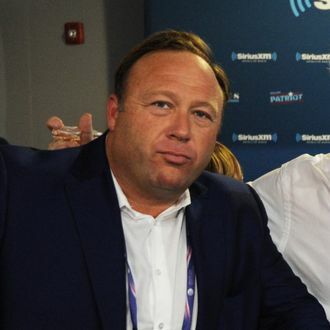 Their 14-year-old son and 12- and 9-year-old daughters have lived with Alex Jones since the couple divorced in 2015. “He’s not a stable person,” Kelly said. “He says he wants to break Alec Baldwin’s neck. He wants J-Lo to get raped.” She said she’s concerned that by threatening Representative Adam Schiff, the top Democrat on the House Intelligence Committee, in a recent rant, her ex committed a felony. “He broadcasts from home. The children are there, watching him broadcast,” she said. During Wednesday’s hearing, state district judge Orlinda Naranjo ruled that the jury could hear a clip from a July 2015 broadcast, in which Jones plays videos his son put together with the help of the Infowars team. “This case is not about Infowars, and I don’t want it to be about Infowars,” Naranjo warned the attorneys.